Many are the times we find ourselves in very tough situations that often look very complex to us and the hope of making it through is very bleak. Well, you will be surprised at how effective making a prayer for a miracle made at The Wailing Wall could be. Over the years, many people who have trusted God for mighty breakthroughs in their lives have received their miracles at this place by offering a simple but at the same time a powerful prayer for a miracle. Do not languish in these situations anymore. Trust God with anything without minding how big it is. 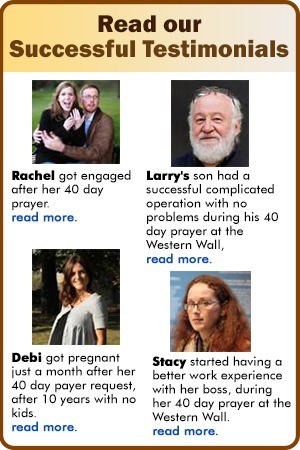 Be it financial breakthrough, divine intervention in your health to mention but a few. Do I need to go to Jerusalem? I suppose this is question that is recurring in your head by now. Well, fortunately for you, you are not obliged to go to The Wailing Wall in Jerusalem to offer a prayer for a miracle. You will agree with me that it is very close to impossible to set aside 40 days from our busy daily routines to go to Jerusalem to pray. With that in mind, Prayer in Israel was born. This is a service that aims at offering miracle prayers for those who cannot make it to Jerusalem but have that zeal to pray fervently for a miracle in their lives. For that reason, when you request for their services, you will be paired with a prayer partner who has accessibility to The Wailing Wall. He or she will take it upon him or herself to commit your prayer aspect into continuous prayer for 40 days without ceasing. It does not matter the prevailing weather conditions. Come rain come sunshine, your prayer partner will make sure that your prayer for a miracle is committed unto God. 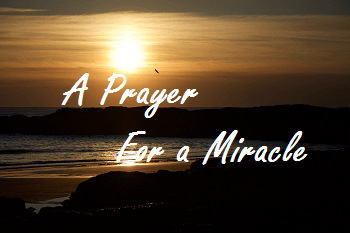 Am I guaranteed that my prayer for a Miracle will be answered? Probably you are wondering whether your miracle prayer will be answered. Well, there is absolutely no reason whatsoever to doubt the credibility of Prayer in Israel. As a matter of fact, many prayers that have been done on behalf of the inter-ceder at The Wailing Wall have actually been answered and positively for that matter. Every day we get to receive many testimonials all over the world of how people have received their miracles after requesting this service. There is divine power and God’s presence at The Wailing Wall and this is what makes the prayers done here receive incredible answers. The Wailing Wall is always the place to offer a prayer for a miracle.